Lutsenko is dissatisfied with Horbatyuk's performance. Prosecutor-General of Ukraine says the PGO until the end of the year will submit the case for an in absentia trial against former President Viktor Yanukovych to court. 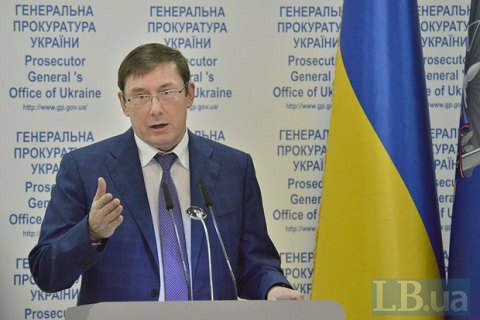 At the same time, Yuriy Lutsenko during a briefing on 9 June expressed dissatisfaction with the work of special investigations department in the GPO Main Investigation Directorate, headed by Serhiy Horbatyuk. This department, in particular, is investigating the case against Yanukovych. The chief prosecutor believes that the investigation has been unreasonably protracted, despite that Mr. Horbatyuk "was given full support of the PGO's leadership. The workforce and the capacities in his department grew twofold and he's got the carte blanche to go ahead." In any event, the prosecutor-general says the trial against Yanukovych is bound to be long. "The charges are serious and have many crime episodes: creation of a criminal organization, distribution of roles, usurpation of power, embezzlement of public funds, violence against civilians, killing civilians. After all, he has called on for [foreign] aggression on the territory of Ukraine," he said. Last summer, the PGO said it was about to launch in absentia trial against Yanukovych. However, the ex-president managed to block the in absentia trial against, using the norm of law that allows a pre-trial investigation (in absentia) only when the suspect is put on an interstate or international wanted list. Yanukovych has filed a complaint to the Interpol claiming the criminal case against him is politically motivated. In response, Interpol has suspended the search of the runaway president. However, in May the Verkhovna Rada amended the law and abolished the international wanted list as a prerequisite for an in absentia investigation. The amendment thus unblocked the way to a trial against Viktor Yanukovych and other former senior officials of Ukraine, whom Interpol refuses to put on a wanted list.